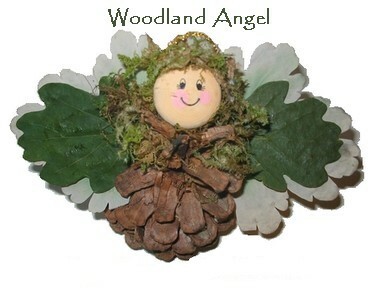 Make a woodland angel to stand on a side table with a pine cone body and wings made from real or silk leaves. 1. Choose a pine cone with open petals and a flat bottom that will stand up fairly straight when placed on a table. 2. 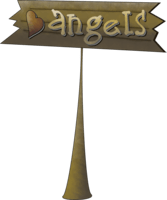 You can use two dried leaves as the angel’s wings, or four leaves, as shown in the photo. If you use four leaves, glue them together in pairs, using small dots of white glue between the leaves. If desired, protect the leaves with a coating of decoupage medium or spray sealer, or decorate with gold spray paint. Glue the leaves in place at the back of the pine cone, near the top where you will be placing the angel’s head. 5. Cut a small length of gold rickrack, gold cord or even thin gold wire and form this into a circular halo at the top of the angel’s head. Secure with a dab of glue at the back. 6. If necessary, break off a petal or two at the top of the pine cone to make room for the angel’s head. Glue the head in place. 7. If you wish to hang the angel from a Christmas tree or in the window, tie a length of invisible thread or fish line to one of the pinecone petals near the head, at the back. On my computer, I just go to to the menu bar, find the word File, then down to Print Preview, check it over, adjust as needed, then hit Print.